Events in North Africa and Japan have added fresh impetus to Russia’s South Stream gas pipeline project, as it races for the tape against European and American competitors. A pipeline race between Russia and the EU and the United States has intensified amid fears of energy shortages following the turmoil in North African states that produce natural gas. With the European market standing to lose up to 10 billion cubic metres of gas a year because of the conflict in Libya – and up to 50 billion more if the conflict spills into neighbouring Algeria – interest is growing in Russia’s South Stream pipeline project, with Germany’s BASF bringing $2bn (£1.2bn) on board last week. “Political instability in Africa and the Middle East, along with fears that a nuclear meltdown in Japan might prompt national governments in Europe to curb their nuclear programmes, makes Gazprom’s South Stream increasingly attractive,” says Yevgenia Dyshlyuk, an analyst with the Russian investment company TKB Capital. With the competing Nabucco pipeline project of several EU countries, and the US unable to secure sufficient guaranteed gas imports from Azerbaijan, Turkmenistan, Iraq and possibly Egypt, Russia is poised to make up any shortfalls in demand. Russia currently delivers around 150 billion cubic metres of gas to the EU a year and has the capacity to sell more: a quarter of the world’s proven reserves lies in the Russian Arctic region. But with some analysts saying as recently as earlier this month that South Stream was on the verge of collapse, the addition of the German giant BASF to a line-up that includes Gazprom, Italy’s Eni and Électricité de France may well have rescued the project with added muscle. “The appearance of the new partner in the South Stream project will speed up the signing of Gazprom’s agreements with countries the pipeline will pass through,” said Anna Znatnova, analyst at Alemar Investment Financial Corporation. equation. The land portion of the project includes the construction of two pipelines, one crossing Greece to Italy, the other linking Serbia, Croatia, Slovenia, Hungary and Austria. Russia has been working to build three pipelines that will supply the bulk of western Europe’s gas needs. It already operates the Druzhba pipeline that runs through Ukraine, and carries about 80pc of Russian gas deliveries to western European clients. It is also building the Nord Stream pipeline under the Baltic Sea that will convey Siberian gas to northern Europe via Germany. South Stream is intended to complete the trio and supply southern Europe. Meanwhile, the competing 3,300km (2,000 mile) Nabucco line is intended to bypass Russia as it pipes natural gas to Europe from the Caspian Sea via Turkey, Bulgaria, Romania and Hungary to Austria and other countries in Europe. But the project is moving slowly because of cash and gas shortages, though its initial capacity was set at just 8 to 10 billion cubic metres a year. The planned launch has been rescheduled twice, and hopes of bringing Nabucco online in 2014 are slipping. And as the Russian project consolidates its lead over Nabucco, its architects say their rivals are trying to hobble South Stream with alarmist comments. “They are raising concerns over increasing dependency on Russian energy supplies and the need to diversify deliveries, fearing that Russia could use the pipeline as an ‘energy weapon’,” according to Konstantin Simonov, head of Russia’s National Energy Security Fund. But the situation is changing all the time. Another problem being faced by Moscow is the Balkan countries’ growing appetite as they look to get their piece of the Gazprom pie. Bulgaria has backtracked more than once as it tries to pressure Russia for better terms. 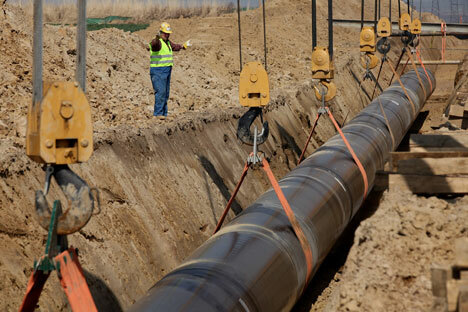 As a result, Moscow is still undecided whether the pipeline should come ashore in Romania or Bulgaria. The greatest hurdle, however, is Turkey, where the government had been due to approve construction of the line last November before negotiations broke down. Ankara is haggling hard for additional benefits on nuclear power plant projects and is trying to talk Moscow into extending another gas project across the Black Sea called Blue Stream. “The Turks want to get as much as they can in return for their permit,” said Sergei Demidenko, an expert on the Middle East at the Moscow Institute of Strategic Studies and Analysis.